You’ll have 75,000 Chase Ultimate Rewards points after earning the sign-up bonus and meeting the $5,000 minimum spending requirement (70,000 Chase Ultimate Reward points sign-up bonus + 5,000 Chase Ultimate Rewards points) on the Chase Ink Plus card. I’ll show you how you can to use those Chase Ultimate Rewards points to get great deals at Marriott. You can get 70,000 Chase Ultimate Rewards points after spending $5,000 in the 1st 3 months on the Chase Ink Plus card. 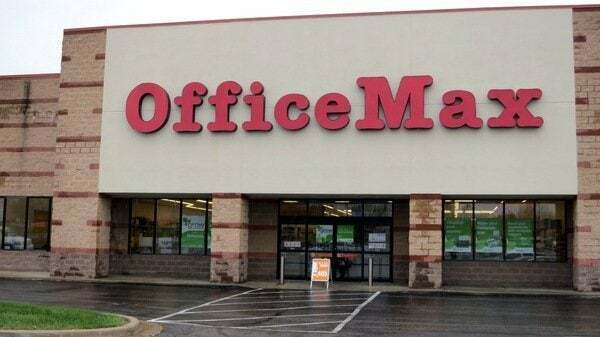 If you’re a Big Spender, you can earn 250,000 Chase Ultimate Rewards point at office supply stores each year. 75,000 Chase Ultimate Rewards Points gets you ~$938 worth of travel booked through the Chase Ultimate Rewards Mall. But I like to transfer my Chase Ultimate Rewards points to airline and hotel partners. Emily and I love using Chase Ultimate Rewards points for flights and hotel stays. 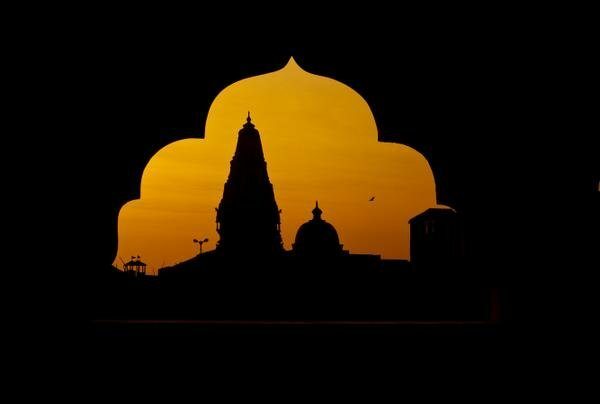 We transferred Chase Ultimate Rewards points to United Airlines and fly Business Class to India. You can also transfer Chase Ultimate Rewards points to British Airways Avios points for short flights in the US. We also used our Chase Ultimate Rewards points to stay at hotels like the Grand Hyatt Macau, Park Hyatt Goa, and Hyatt Regency Huntington Beach. But we’ve never transferred Chase Ultimate Rewards points to stay at Marriott hotels, because it usually isn’t a great deal. Because the Chase Ink Plus card is offering a 70,000 Chase Ultimate Rewards points sign-up bonus, I wanted to look further into the Marriott program. 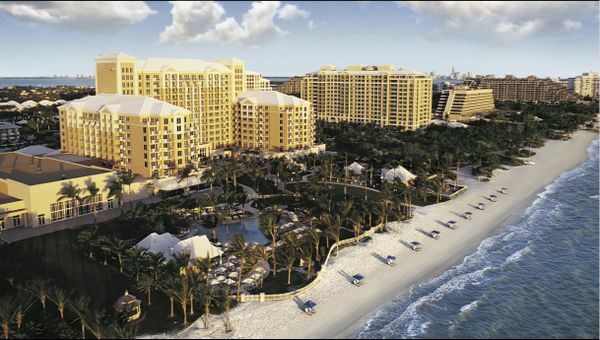 Marriott has 187 Category 1 hotels so you have lots of choices. 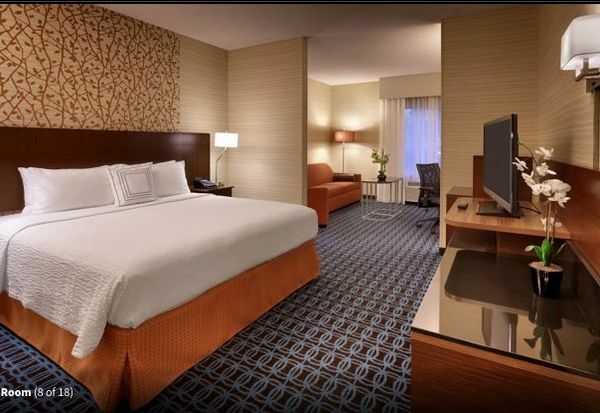 You could stay 10 nights at the Category 1 Fairfield Inn & Suites Yuma by transferring your 75,000 Chase Ultimate Rewards points to Marriott points. 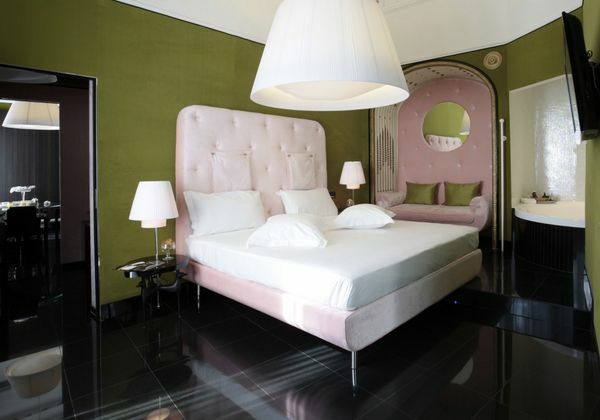 Or you a 1 night stay in a Category 9 hotel like the Boscolo Palace Roma in Italy for 45,000 Marriott points. This seems a bit expensive to me. And when you redeem 4 nights, you get the 5th night free. 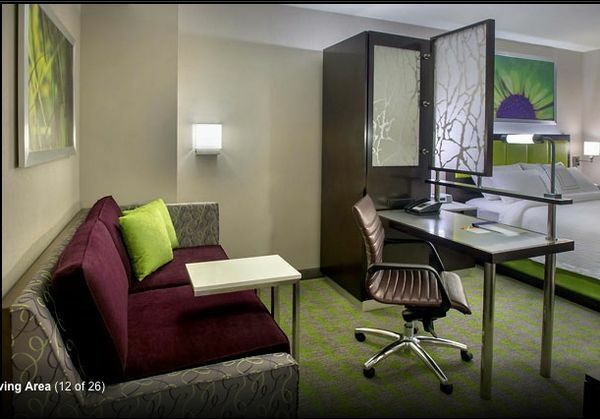 So you can use the 75,000 Chase Ultimate Rewards points from the Chase Ink Plus sign-up bonus and completed minimum spending + 25,000 Marriott points, to stay 6 nights at a Category 5 Marriott hotel like the Courtyard Washington, DC/US Capitol. But this wouldn’t work for business travelers or folks who need to know in advance where they’re going to stay. PointSavers hotels change each week so the offers are constantly changing. Here are the best ways to get Big Travel with Small Money at Marriott by transferring Chase Ultimate Rewards points to Marriott. Emily and I spent a weekend in New York to celebrate my birthday, but we stayed at the Andaz 5th Avenue. But we could have transferred our Chase Ultimate Rewards points to Marriott. 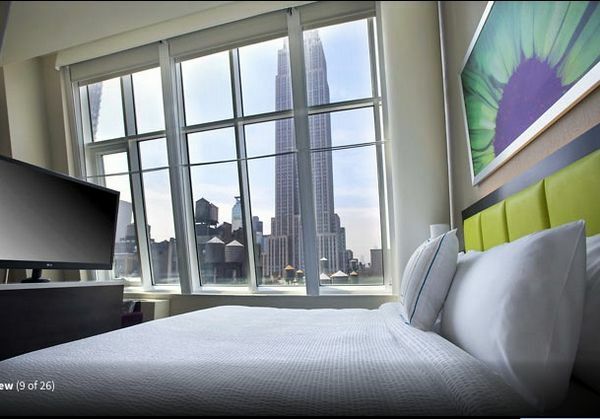 You can transfer 70,000 Chase Ultimate Rewards points to Marriott and get 2 nights at the SpringHill Suites New York Midtown Manhattan/Fifth Avenue, a Category 7 Marriott hotel. But you can spend fewer Hyatt points for 2 nights in a better New York hotel! 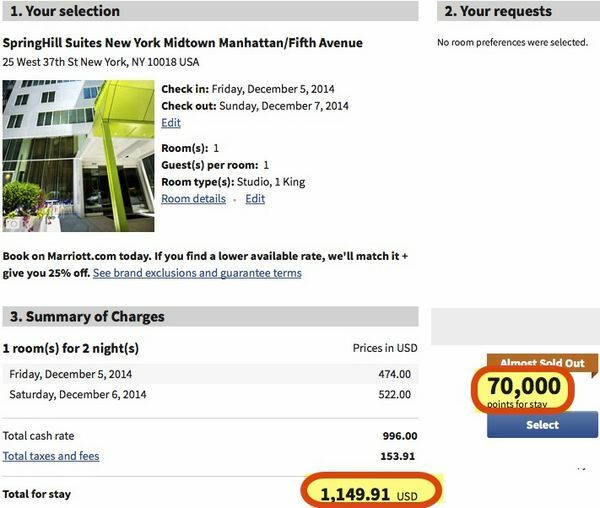 It would cost ~$1,150 if you used cash, or 70,000 Marriott points for 2 nights on December 5, 2014, to December 7, 2014. Transferring Chase Ultimate Rewards Points to Marriott Saves You ~$1,150! 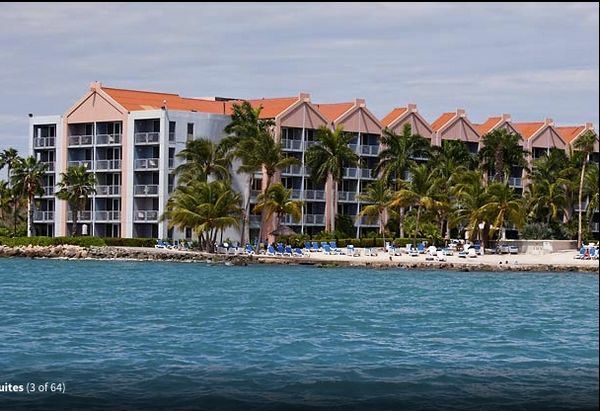 70,000 Marriott points (transferred from Chase Ultimate Rewards) gets you 2 nights at the Category 7 Renaissance Aruba Resort & Casino in Aruba. 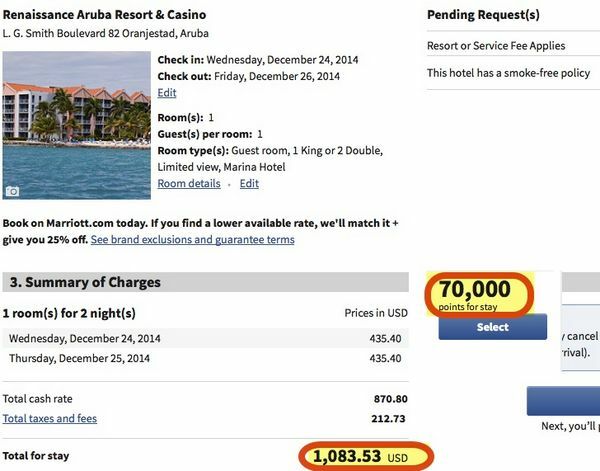 You would save ~$1,084 by using Marriott points to pay for a 2 night stay at the Renaissance Aruba Resort & Casino in Aruba on December 24, 2014, to December 26, 2014. 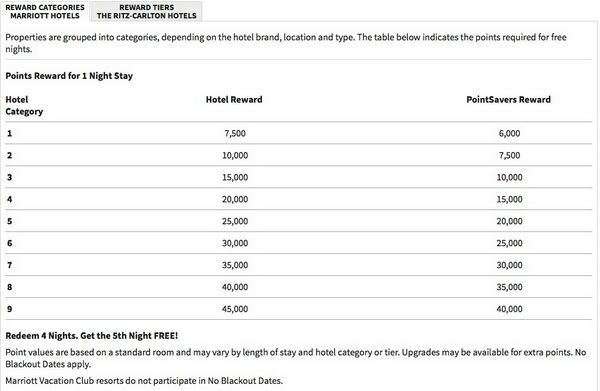 If you already have Marriott points, transferring your 75,000 Chase Ultimate Rewards points to Marriott can help get you closer to a 7 Night Marriott hotel stay using the Marriott Hotel + Air packages. With Marriott Hotel + Air packages, you get a 7 night Marriott hotel stay AND airline miles! 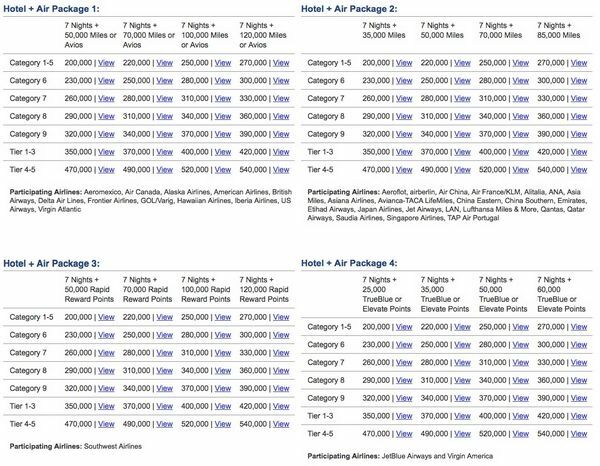 The number of airlines miles you earn varies depending on the airline. You could book 7 nights at a Category 8 Marriott hotel like the Paris Marriott Opera Ambassador Hotel and pay 240,000 Marriott points. 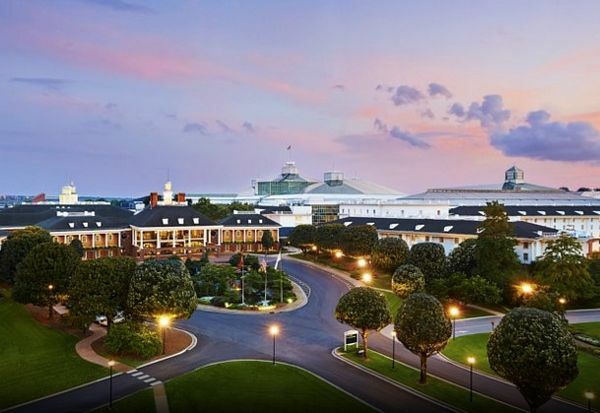 But if you already have at least 290,000 Marriott points in your account, you could book this category 8 hotel as a Marriott Hotel + Air package and get 55,000 United Airlines. You can transfer your 75,000 Chase Ultimate Rewards points from the Chase Ink Plus card sign-up bonus and minimum spending <insert 70k link when live> to United Airlines. With the 55,000 United Airlines miles from the the Marriott Hotel + Air package and the 75,000 United Airlines Miles from transferring your Chase Ultimate Rewards points, you’d have enough United Airlines miles for two 1-way Business Class tickets to Paris! You can’t book Marriott Hotel + Air packages online. Call Marriott at 800-321-7396. You can transfer the 75,000 Chase Ultimate Rewards points you get from signing-up and completing the minimum spending on the Chase Ink Plus card to Marriott. Emily and I usually transfer our Chase Ultimate Rewards points to Hyatt. But you may be able to get Big Travel with Small Money by transferring your Chase Ultimate Rewards points to Marriott too. But it isn’t usually a great deal, so be careful! You can also use your Chase Ultimate Rewards points towards the cost of a Marriott Hotel + Air package. You forgot to mention Atlantis they are now a marriott rewards partner.